Please note it takes two working days for us to process your repeat prescription request. We have gathered a team of 14 members of staff including 2 GP's, 3 Nurses, Management, Administrators, Secretaries and Receptionists to race in recognition of our patients, friends and families who have been or are affected by Cancer. 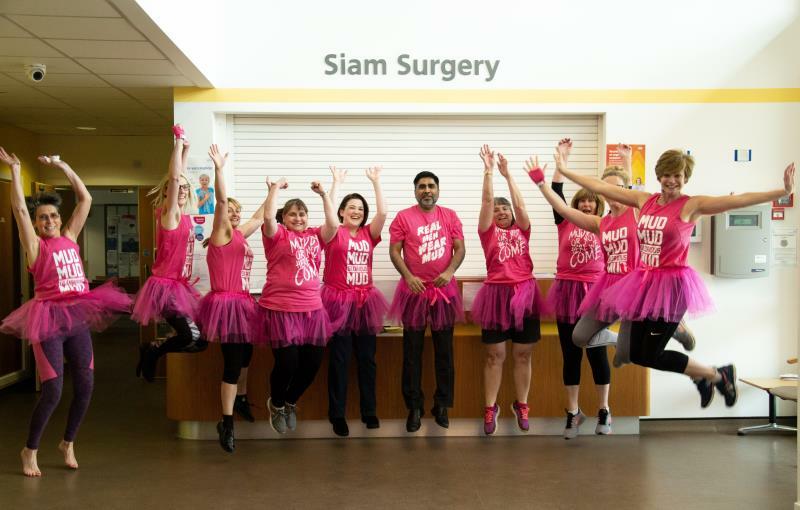 If you would like to donate, please visit our just giving page https://fundraise.cancerresearchuk.org/page/siam-surgerys-race-for-life-team-page, or see our receptionists at the surgery. We will keep you updated on our very muddy journey, please sponsor us today! With patients' needs at the heart of everything we do, our website has been designed to make it easy for you to gain instant access to the information you need. As well as specific practice details such as opening hours and how to register, you’ll find a wealth of useful pages covering a wide range of health issues along with links to other relevant medical organisations. The website is an ongoing progress and will be updated on a regular basis. There is free parking on site for all patients. Buses- At present there are Chambers and Felix bus services which run from various locations, dropping off and picking up at the health centre. We appreciate that patients have time schedules they need to stick to when using public transport and we do our best to work alongside these where possible. You can pick up bus timetables from reception or visit Chambers and Felix online. GoSTART Community Transport- GoSTART is a local transport service for anyone who is unable to use conventional bus services or other means of transport through disablility, isolation, affordability or availability. To access this service you will need to register online by following the link below, or by picking up a form from reception. Please see the website for more information on times, charges and elegibility. GoSTART are now running a trial bus service on Tuesday's and Thursday's between 10.00am & 2.00pm from Great Cornard to Glemsford via The Health Centre, Tesco and Long Melford.